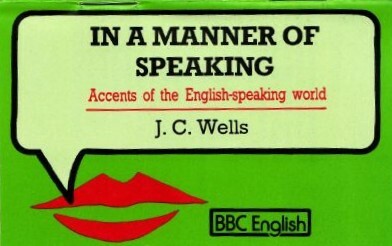 When my three-volume Accents of English (Cambridge University Press, 1982) was published it was accompanied by a cassette with recorded specimens. The same tape was also published by BBC English under the title In a Manner of Speaking. Both cassettes have been unavailable for many years. Now, with the agreement of the publishers, the recordings have been converted to digital form, and can be accessed from this site. Currently, the links do not work properly with all browsers. If this applies to yours, try using Internet Explorer. 1. The first specimen is of Received Pronunciation (RP). It comprises the test passage*, spoken by Susan Ramsaran. RP is the standard accent of English in England, and the accent taught to overseas learners of English in many countries. Some of its phonetic characteristics are as follows, with examples from the test passage. LOT has a rounded vowel, [ɒ]: o'clock, stopped, vodka. Non-rhotic distribution of /r/, historical /r/ having been lost except before a vowel: work, hour, later, started, earth tremor, utterly [ˈʌtl̩i]. Linking /r/, though, before a vowel: after I'd had, quarter of; also intrusive /r/ between /ə/ and a following vowel: vodka or. Centring diphthongs in NEAR, SQUARE, CURE: steering, air, fury, experience, there, during. Weak suffix in -ary: momentary /ˈməʊməntrɪ/; but not in -ile: hostile /ˈhɒstaɪl/. Broad vowel, /ɑː/, in BATH: after, past, vast, ask. The vowels of THOUGHT, NORTH and FORCE are all identical: awesome, horse, force. GOAT is a diphthong with a central starting point, [əʊ]: drove, local, momentary. "Smoothing" may make a diphthong monophthongal when before another vowel: throwing /ˈθrəʊɪŋ/ [ˈθrəɪŋ], diabolical [daə-]; /iː/ and /uː/ may become [ɪ, ʊ] before a vowel: two o'clock [ˈtʊəˈklɒk]. The yod semivowel /j/ is retained after /t, d, n/, sometimes after /s, z/: during, new, supernatural. Here is my discussion of the RP specimen. 2. The second "reference accent" is General American. "General American" is the label which may be applied to the speech of the majority of Americans whose speech has neither Eastern nor Southern characteristics. The speaker on the tape is from Seattle, Washington state, in the Pacific Northwest. LOT has an unrounded vowel, [ɑ]. Rhotic distribution of /r/: /r/ is pronounced wherever the spelling includes r. No intrusive /r/. No centring diphthongs as distinct phonemes: experience has the same [-pɪr-] as spirit. Suffix vowel strong in -ary /-ɛri/, weak in -ile /-l/. BATH has the same /æ/ as TRAP. GOAT ranges from a monophthongal [o] through [oʊ] to an almost RP-like [əʊ]. Often no /j/ after /t, d, n/: during. No /j/ after /s/: super-. Tapping and voicing of /t/ between vowels: unforgettable (rhymes with incredible), quarter, later, sitting, waiting, started. Here is the test passage. And here is my discussion. 3. Next comes the North of England. the absence of "BATH Broadening", i.e. BATH words have the same vowel as TRAP (in the north often [a] rather than [æ]). The first speaker has [ʊ] in the words just, Scunthorpe, fun, club, London, much; and [a], rather than RP [ɑː], in dancing and basketball. Like broad-accent speakers in most parts of England, he has "variable /h/" (sometimes [h] is present, sometimes absent). Note hesitation at hobbies; H Dropping in I've 'ad, get the 'ang of. This is typical of working-class speech in England. So also is the pronunciation of the -ing ending as [ɪn] (or [ən, n̩]) rather than as [ɪŋ]; note train-spottin', somethin'. [ʔ] (glottal stop) as the pronunciation of the definite article: in t' park = in the park. Also [ʔ] for /t/ elsewhere (go' any = got any). A diphthong [ɪu] in rhubarb. The adult interviewer uses the typical northern pronunciations of laugh [laf] and funny [ˈfʊnɪ]. The last speaker is a Birmingham child. Unlike the Leeds children, he has a marked diphthong in FACE (as in train [trʌɪn] — but he also has a short vowel in past. 4. The South of England. Again, there are several excerpts under this heading in the recording. First is a typical accent of the West country — a man from Andover, Hampshire, talking about the name and history of the town. Note that this is a rhotic accent, with /r/ in words, water, important. The speaker uses a hypercorrect [h] in (h)ancient. BATH has the broad vowel: past [pɑːst]. MOUTH has a diphthong [ɛʊ]: crown, township. The second speaker is from near Oxford. He has a long front vowel [aː] not only in BATH (master, staff), but also in START words (farmer): although this used to be a rhotic area, it is so no more. Note also [ɪn] in swimmin', and [ʌɪ] in PRICE words (quite, wine, fight) (Diphthong Shift, eɪ → ʌɪ). The last speaker is a boy from rural Norfolk in East Anglia. Note particularly the [aː] of BATH (laugh) and the characteristic rhythm (as in the word anybody). The working-class accent of London is known (in its broadest form) as Cockney. It is an important source of new pronunciation trends, since innovations often spread from the capital to other places (but not vice versa). Notice the typical working-class forms with [ɪn] (Wappin' = Wapping) and H Dropping (didn' 'ave). Diphthong Shift means that FLEECE, FACE, PRICE, CHOICE take on the qualities [əi, ʌɪ, ɒɪ, oɪ] (feet [fəiʔ]). T Glottalling makes /t/ [ʔ] in many syllable-final environments, and in broad Cockney the same may happen to /p/ and /k/. TH Fronting, another Cockney characteristic, involves using [f, v] instead of standard [θ, ð], as either [ˈɪivə], both [bʌʊf], father [ˈfɑːvə]. MOUTH has the Cockney form [æə] (food in the house [fuːd n ði æəs], with H Dropping). This is an example of very careful speech, "adoptive" RP. It includes /hw/ where the spelling is wh- (where, what, which), and "clear" /l/ in field, people. Most RP speakers use plain /w/, not /hw/, and have "dark" /l/ except before vowels. There are considerable differences between the North and South Welsh accents. The speaker in this recording is from Carmarthen (Caerfyrddin) in Dyfed, South Wales. Note the monophthongs in FACE, [eː] (Wales) and GOAT, [oː] (don't, hope). However, this speaker uses a diphthong in play; some speakers distinguish pairs such as daze/days, nose/knows. The quality of the NURSE vowel is rounded and rather front, [œː] (certainly). The TRAP vowel is open, [a[ (that, valleys), and the STRUT vowel is [ə] (up). The consonant /r/ is tapped [ɾ] (brought, glory). There are three excerpts here: first, speakers from Aberdeen in the northeast and Dumbarton in the west, both talking Standard English (the second one reading the test passage). Note the absence of any distinction between FOOT and GOOSE: these vowels are merged in Scottish English (full = fool). Note /hw/ in when and wheel (no "Glide Cluster Reduction"). This is a rhotic accent; note also the retention of historical vowel contrasts before /r/ in words of the NURSE set (purposes with /ʌr/ but perfect with /ɛr/, and a similar distinction distinction in the test passage between worse and earth). The vowels of NORTH and FORCE are distinct (horse, force), but not those of LOT and THOUGHT (horrible, awesome). Lastly, there is a man from Falkirk in central Scotland reciting a poem in Scots dialect (which a knowledge of Standard English alone will not enable you to understand), namely Robert Burns's Ode to the Haggis. Note the velar fricative [x] in dicht ('clothed'), slicht, bricht, sicht (= English dight, slight, bright, sight). 9. Ireland. The first excerpt is from Northern Ireland, where the local accent agrees in many respects with Scottish speech (merging the FOOT and GOOSE vowels, for instance: note should pronounced like RP shooed). Among the special Ulster characteristics are a MOUTH diphthong which ends in a central, usually unrounded, quality, [ʌɨ] etc. : note out, sounds, now; and a distinctive range of intonation patterns. /l/ is clear in all positions. 10. General American revisited. The first speaker is the same person as spoke the test passage (no. 2 above)— but talking freely now, without a script. The second is a man from Long Island, just outside New York City. Note again the typical voicing of /t/ (thirty, city, water). Compare this accent with no. 11 below. The third excerpt is part of an interview with a man from the south (New Orleans), who has nevertheless very little trace of a 'southern accent' — perhaps because he has lived in the north for many years. Note the nasalized voice quality, which the British feel often characterizes American speech; and observe the variable rhoticity, resulting from the conflict between southern dropping of historical /r/ and its retention in General American. use of a tense, rather close quality in certain TRAP and BATH words (cab) — something widespread but stigmatized in the United States. 12. Canada. In many respects a Canadian accent agrees with General American. Note, for example, T Voicing (British). Canadians usually have the THOUGHT and LOT vowels identical as [ɑ] or [ɒ] (talk, always). In PRICE and MOUTH special 'raised' variants are used before a voiceless consonant, thus [əi] in quite, [əu] in about (but [aɪ] in wide, [ɑʊ] in loud). Both these features are also found in the United States, but not usually together. 13. United States: New England. Eastern New England — the area around Boston, Massachusetts — has a distinctive local accent. In particular, various innovations made in England have been adopted here, though not in most of North America. It is here, for instance, that BATH words are often pronounced with the same vowel as START ([baːθ, staːt] — compare General American [bæθ, stɑrt]). Other Americans are very aware of these pronunciations, even though they sound quite ordinary to British or Australian ears. In the recording, note regard. Note also the variability of /r/ in the environments where non-rhotic accents lack it (course, support but first). Pressure from rhotic General American leads many speakers to restore (some of) the historical /r/s lost in their basically non-rhotic accent. The speaker in the recording is from Maine. 14. United States: the South. There are two excerpts in the recording: the first of a well-known white evangelist, the second of a black. Note the non-rhotic distribution of /r/ (reporters are there; in the second excerpt, morning), and also the lack of the linking /r/ usually found in non-rhotic accents such as RP (take care of). A characteristic southernism is the use of a monophthongal (or nearly monophthongal) [aː] for PRICE in certain environments (time, but not before the voiceless consonants of liked, fight, right). Note again the typical American T Voicing (meeting). The pronunciation /ʌmbl/ for humble is not British-style H Dropping but the preservation of an older pronunciation, as also in herb (American usually /ɝb/, RP /hɜːb/). These words came into English from French, where no [h] is pronounced. 15. The West Indies. The two excerpts here are from Jamaica and Montserrat respectively. In popular (working-class) West Indian speech /t/ and /d/ are used in place of the standard TH sounds /θ/ and /ð/, so that no distinction is made between tin and thin, breed and breathe. (Compare no. 11 above.) But this is a stylistically and socially sensitive matter; speakers are often inconsistent. The same applies to another widespread West Indian pronunciation characteristic, namely the dropping of /t/ from final clusters in words like nest and of /d/ in words like stand. Note the broad (long) vowel in BATH words (half past) and the tendency to avoid [ə] (completely). Words such as realize are stressed on the last syllable. Clear /l/ is used in all positions (deplorable), and /w/ has a special allophone [ɥ] when followed by a front close or mid vowel (where, we). 16. Australia. At the upper end of the social scale an Australian accent is very similar to RP. But for most Australians there are several important points of difference. The START and GOOSE vowels are fronter, being of the type [aː, ʉː]. There is a Diphthong Shift similar to that found in the South of England. In the recording, note the qualities of PRICE (in the pronoun I) and FACE (Australian). The front short vowels (TRAP, DRESS, KIT) are closer than is usual in RP or General American (fact, practice). Where RP has unstressed /ɪ/, Australian usually has either /i/ (in final open syllables, thus happy) or /ə/ (elsewhere). E.g. solid ends like salad. the pronunciation of KIT as a central vowel, [ᵻ], rather than front, [ɪ] (sitting). the use of an [eː] quality in NEAR (steering, merely). Many New Zealanders do not distinguish NEAR from SQUARE (steer = stare, as also in the West Indies). the use of /æ/ rather than /e/ before /l/ (felt; elf = Alf). L Vocalization, the use of a vowel or semivowel in place of dark /l/ (gentle) — widespread also in England. intrusive /r/ as in RP (vodka or). the KIT vowel splits in two, having an [i]-like quality at word boundaries and next to velars, but a [ə]-like quality elsewhere (sinks; minute). All southern hemisphere accents share a closish quality in DRESS (red). word stress sometimes deviates from that of other accents (acquire [ˈɛkʋaɪɹ]). 20. Africa: Nigeria. In black Africa, too, English is typically coloured by the phonetics of the first language. The recording is of a Nigerian whose first language is Yoruba. Note in particular the vowel system: [ə] is rarely used, and certain standard vowel contrasts, such as that between KIT and FLEECE, are not always made. The th sounds tend to be replaced by /t/ and /d/ (rather [ˈrada]; compare no. 15 above). There is voicing of certain consonants which are voiceless in RP (looked, the fact that). *Test passage. One day last year, when I was driving back to work after I'd had lunch, I had an amazing and unforgettable experience. It must have been two o'clock — or perhaps a quarter of an hour later, a quarter past two. It was an incredible thing, really: I was sitting there at the steering wheel of my new car, waiting for the lights to change, when all of a sudden the car started to shake this way and that, rocking from side to side, throwing me backwards and forwards, up and down. I felt as if I was riding a bucking horse. Worse than that, some mysterious spirit or hostile force seemed to be venting its vast fury upon the earth. And the noise! — there was a kind of deep groaning and horrible awesome grinding which seemed to fill the air. And then, a short while after, the whole paroxysm had stopped, just as suddenly. Everything was calm and smooth again, quiet and peaceful once more. I put my foot down, just a gentle pressure on the accelerator (or the gas pedal, as it's known in America), and drove off. Everything was utterly normal once more. So then — was this some very local and momentary earth tremor which had struck us? Or, I ask myself, was it a supernatural visitation, some fiery storm of diabolical wrath? Or was it, rather, merely that I'd drunk a double vodka or two during my lunch?